The US will put on over 16,000 fireworks displays this 4th of July, in celebration of its 241st birthday. Dark skies across the country will light up in aerial peonies, willows, crossettes, horsetails, and fire balls. And the best of the best — with finales that seem to bring back daylight — might not be where you think they’d be. This celebration practically comes with its own festival. On July 3rd, you’ll find Civic Center Park packed with people, food trucks, bumpin’ stages, and a light show on the Denver City and County Building — before the fireworks even get going. There’s so many displays going in and around Denver this weekend, you could catch this one and still have time to hit up half a dozen more. The light rail or the city’s B-Cycle program make navigating a breeze. What puts Atlantic City on this list is the sheer number of viewing options — you can plop down almost anywhere on the Boardwalk and get a decent view. And, there are two shows. The first is at the Borgata in the Marine District around 9:15; the second at the Tropicana around 10. For an obvious stop, chill at the Borgata’s beer garden for suds, live music, and a close seat to the show. The 1.5-mile Taneycomo Lakefront on Branson Landing has a boardwalk meant for fireworks. Nearby are the Branson Landing Fountains, where you’ll find twenty-some thousand gathering on July 3rd. Close-proximity pyrotechnics are a large feature of this show, and you’ll find them focused around the waterfront. If you come early, you’ll be in time for the The Liberty Light Up Concert, right underneath where the fireworks will blaze. Music City July 4th, the name of Downtown Nashville ’s Independence Day event, isn’t just an ode to the city’s history — it’s how they do this celebration. The Nashville Symphony performs to the choreographed fireworks show, and live music will be happening all day and night. Events start early, and there’ll be giveaways, food trucks, inflatables galore, merchandise, trivia, multiple stages; an app (free for download) is available to keep track of it all. Even though the fireworks are big enough to be seen all across town, you’ll want to be on the south shore of Lake Tahoe for this extravaganza — or on the lake itself. Edgewood and Lakeside Beaches are the best spots on land to take in the show — bring all your standard picnic gear (there are grills) and plan to get there early. Otherwise, hop on the M.S. Dixie II, a Mississippi-style paddle wheeler, or get on a yacht through Tahoe Cruises — music and free-flowing drinks included. The “Melaleuca Freedom Celebration,” held for the past 25 years, has always been one of the nation’s best. But in true American fashion, this year’s is promised to be bigger and better — and higher. Last year averaged 10 shells a second. There’s going to be over 17,000 lbs. of fireworks, and the show lasts a raging 31 minutes. It’s rumored to be the biggest fireworks display west of the Mississippi. This town of 19,000 becomes a town of half a million overnight on July 4. Addison is about 20 minutes north of Dallas, and the 30-minute show — Kaboom Town! — is timed to music broadcast on a local radio station. This year has the new “ghost shell” display, a type of firework that explodes linearly from one side to the other, appearing almost out of nowhere. The Capital’s fireworks are released above the Lincoln Memorial Reflecting Pool on the National Mall . It’s only an 18-minute show, but with the reflections, it’s more like 36. And if navigating the crowds on the Mall sounds like torture, get on a boat on the Potomac — you’ll have your own private viewing. 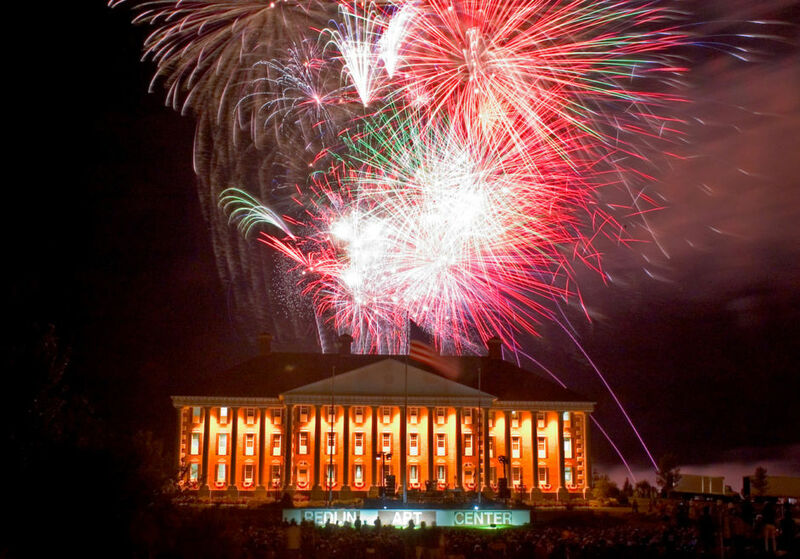 July 1st at the Redlin Art Center might be where the nation kicks off its birthday holiday. The largest fireworks display in the state rakes in nearly 40,000 people — which might not sound like a lot, but the state’s population sits around 800,000. Part of the reason the show is so grand is due to Lew’s Fireworks, Inc., a family fireworks company with roots in the town. Grab a spot on the art center’s expansive lawn, watch the reflection in one of the lakes, and give a warm welcome to America’s 241st year.